Brian Burke, president and general manager of the Toronto Maple Leafs, announced Friday that the hockey club has agreed to terms with free agent goaltender Jussi Rynnas (pronounced YEW-see RIH-nuhs) on a two year NHL Entry Level contract. 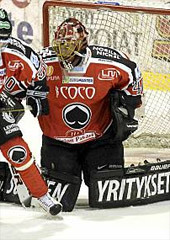 Rynnas, 22, had the top save percentage (.929) during the 2009-10 season while playing for Assat in Finland (SM-Liiga). In 31 games this past season, he posted a goals against average of 2.50. The native of Pori, Finland is six foot five and weighs 205 pounds.